- Sometimes, you must enhance all the Designs (Weapons, helm, Pets, etc) before you can use it. - You may want to use your Search Button for fast finding the items you're looking (for Windows: press Ctrl - F). - For the Animation, you may want to use Opera Browser or Mozilla Firefox, if you can't see the animation, because this site has been tested on Opera or Mozilla Firefox Browser. If you use Mozilla Firefox and after you load the page, all you see is the white screen, then try to open new tab. It will then load the movie. -- Desc: Equip Necromancer class to have this pet fight for you! With enough manipulation, anything is possible. The Betrayal Blade now fights for you on it's own! -- Desc: Wahaha! Your enemies thought it said "angel" blade. Guess again! -- Desc: The gentle rolling of ocean waves is captured forever in this staff. The soft blue glow is reminiscent of the moon's light as it travels down to the bottom of the sea. And though these images are tranquil and soft, the power within the staff is great and thunderous. It will be a boon to those you battle. -- Desc: Masterfully crafted by your eight-legged comrades, this armor allows you to harness the powers of the Arachnid! -- Desc: Your bark is worse than your... bark! You might have to stand very still for a very long time for this armor to take shape. Plant a tree this Earth Day and dress up as one, too! -- Desc: Shake things up with this staff. The sweet wintry scene within the snowglobe hidesa torrent of magic that will leave your enemies fallen and cold. Stare into this crystal clear dome and meet your fate. -- Desc: Only the most worthy of royalty can tame the frigid northlands! -- Desc: Swindle says, oh, it's a "Bee Sting Dagger". Once this weapon goes into a victom, it's probably not coming out. -- Desc: Forged from 6 rare jewels, this sword has one of the sharpest edges anywhere! -- Desc: These mysterious beasts seem to have traveled here from another dimension. -- Desc: A big bad axe to slay big bad wolves... and other things. Simple but effective! -- Quest: AQWorlds 3rd Birthday - They Might Be Giants! -- Desc: Lorean scientist are certain this dagger exists, and when you wield it, you'll be able to probe them right! 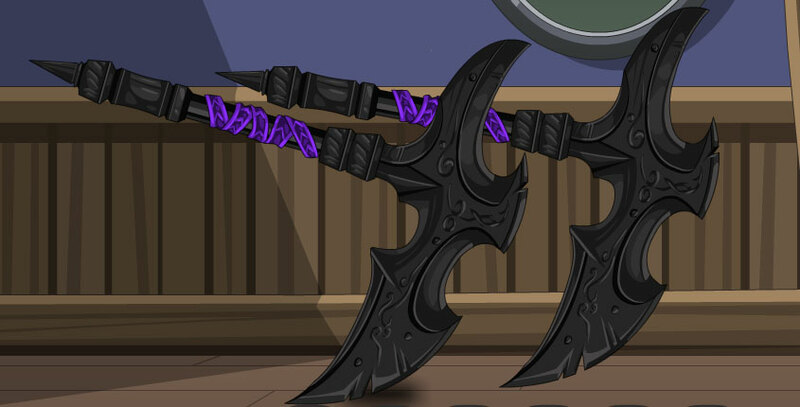 -- Desc: Could this be a corrupted version of Artix's axe? -- Desc: This 9.5 gallon hal even comes with its very own organic-hair mustache! -- Quest: Valencia Task: 2nd Task - Monday... Bone Mace! -- Desc: Swindle says, that's "Bone Walking Cane". Now walk away and get me more of the items I need! -- Desc: Barfight anyone? WATCH OUT FOR THAT STOOL! -- Desc: All you need now is a player piano. -- Desc: and it's cute! -- Desc: Viridi's sacrifice will not be in vain. Wear these wings and never forget! -- Desc: This armor is covered in the remains of the Chaorrupted monsters you have slain! With every step you take, you show Chaos that you are one to be feared! -- Desc: This helm was created using the remains of the Chaorrupted monsters you have slain! With every step you take, you show Chaos that you are one to be feared! -- Desc: You can't start a Barbershop Quartet without one! -- Desc: The essence of Time has been molded into a flowing, glowing blue blade. There is always the danger when wielding it that you will be hurled through space and time into a whole new dimension! -- Desc: The cold-hearted person can break anyone with a glance or word, so imagine what a sword of the same disposition can do! No longer able to beat, this heart spreads its cold and bitter emotions into the blade. -- Desc: Nulgath takes your signed contract in exchange for this impressive "Corpse Maker of Nulgath". You're excited yet uneasy, as Nulgath goes on to say, "Enjoy! As it states in the contract you signed, you can owe me later for this"
-- Desc: What luck! You've won the "Cruel Dagger of Miltonius"
-- Desc: Swindle says, that's a "Dark Cyclops Face". -- Desc: The scorned, the forgotten, the put aside... all those who have felt the sting of love's negative side willingly emptied their hearts to a mage who felt jaded and thought the world needed to know exactly how he felt. -- Desc: Ancient proverb says, "The Deathknight Spear-it will Forever Battle On." Even the Ancients loved play-on-words! -- Desc: This sturdy pewter staff has a hauntingly realistic gilded skull on the top end. Do you think that is where the name is derived from...? -- Desc: Swindle says, it's a "Dragon Bone Hammer". Lucky you! -- Desc: Miltonius slayed a dragon and crafted this sword from it's very bones. Congratulations on winning the "Dragonbone Axe"! -- Desc: Miltonius slayed a dragon and crafted this sword from it's very bones. Congratulations on winning the "Dragonbone Blade"! -- Desc: Swindle laughs. That there is sure to bring you attention at a party. A "Duck on a Stick" is always amusing. -- Desc: Has anyone told General Porkon about this? -- Desc: Earth, Wind, Fire and Water are nothing without the power of the element of Heart! This Element loves you so much that it will follow you anywhere! -- Desc: Swindle says, I picked up that "Emblem Mace" during my stay at Sword Haven. -- Desc: The fabled blade of Sir Tendeth once thought lost to the ages. You've fought off the worst of the worst and now this beautiful sword has been found! -- Desc: The Evolved Clawsuit is an unexpected (and unwanted) gift to all the naughty beings of the world. You spread more damage than cheer-- and are incredibly good at it. Merry Frostval! -- Quest: Carnaval! Terra da Festa! -- Desc: Parade down the streets of the Sambodromo while wielding this festively ferocious polearm. Try not to hit any dancers! -- Desc: A very stylish axe great for chopping trees. -- Desc: ...but how did the ghost get in there? -- Desc: The Darkness shines brightly inside this blade. Look away, lest your spirit flee in agony! -- Desc: Nulgath takes your signed contract in exchange for this impressive "Godly Golden Dragon Axe". You're excited yet uneasy, as Nulgath goes on to say, "Enjoy! As it states in the contract you signed, you can owe me later for this"
-- Desc: A glorious golden blade, befitting an eternal hero. -- Desc: One unlucky Friday the 13th, the townspeople of Falconreach awoke to find golden monsters gilding their world. The buildings, the grass, even the tog pets were MUCH shinier! We thought we'd bring the bling to you! -- Desc: Miltonius empowers your Creep Blade transforming it into a more impressive version. -- Desc: Whatever you do... don't look underneath you, or you just may see your shadow. Happy Groundhog Day! -- Desc: Shadowed by might, this helm's unique energy streaks will help to repel any attack that comes your way. The unique horns pull all energy into the helm, causing not only a display of power, but a formidable defense. -- Desc: Despite Alfred Hitchgreen's prominent birth, this outfit seems to fit you perfectly! All of your friends will be green with envy! -- Desc: This li'l cutie is lost, cold, but is VERY happy to have found a new friend! -- Desc: Just like the king of the jungle, you must let your subjects know just who's in charge! -- Desc: This axe is made to rip and tear the Horc's enemies asunder. -- Desc: Nod at the passerbys as they rush along their way. You may look good, but they also know you are not to be messed with. This armor screams "Don't mess with Tex!" -- Desc: When left out in the cold, those who have no where to turn... turn on each other! -- Desc: During the long winter nights of Frostval, they come in search of destruction. The Ice Protectors defend the weak and the innocent when all hope seems to be lost. -- Desc: The legendary blade of the rulers of the Northlands. Wield this well, Your Majesty! -- Desc: The legendary blade of the rulers of the Northlands should only be drawn when the world has ended... and one must break through the ice to a new dawn! -- Desc: Swindle tells you that this is an "Iron Plate Hammer". -- Desc: This spear has been corrupted to the core! -- Desc: Make a joyful battle-noise because of your sword! -- Desc: Mmmmm... perfect for telling ghost stories around a campfire. Find a campfire during the event and click on it to make a roasted Marshmallow on a stick! -- Desc: This groovy blossom loves to spring into action as soon as it's warm enough outside! -- Desc: Crash into battle on your clockwork steed! -- Desc: The sun is beating down and making cracks in the ground. There's nowhere else to stand, but with this blade in your hand, you'll be able to defend the Kingdom King Alteon reigns! -- Desc: Swindle say, this is a "Mysterious Walking Cane". Miltonius might have need of this in the future. -- Desc: Necro U! Necro U! This is what you need to do! Raise your minions HIGH! Drop your minions LOW! Doom them, Doom them, GO GO GO! -- Desc: Campfire... toxic nuclear waste... same thing, right? This very unlucky marshmallow emits a strange color custom glow-but at least it's not burnt! -- Desc: You sprout fiendish horns from yourhead as the taint within you grows ever stronger! -- Desc: What's that you say? Well, I simply used some extra souls I had to create this mini version of me. -- Desc: She is so small, but already a mother! Protect her until the day comes when it is safe for her and her children to live in peace! -- Desc: Swindle says, that's an "Ordinary Cape"
-- Desc: Swindle say, that's an "Ordinary Iron Wing Helm". It's useful as a base for more extravagant helms to be made from though. -- Desc: Paladins are the honest and good protectors of... GOOD and GOODNESS! -- Desc: Swindle says, very nice, you won a "Parasitic Hacker". -- Desc: Ruffle your feathers and strut your stuff in this elegant peacock-inspired outfit! -- Desc: According to legend, if a groundhog sees its shadow when emerging from its burrow, this signifies 6 more weeks of winter. Let's hope it doesn't see that shadow! -- Desc: Cheep! Cheep! This pink marshmallow fellow will help you spring into step this season! -- Desc: You win a "Platinum Battle Shank". Miltonius could need this in the future. -- Desc: Look simply dashing in Edgar Allen Plum's outfit! But, if you're wearing all of his clothes, then that means… !!!! -- Desc: Strike fear into your enemies' eyes while donning this royal armor. Only the strong will survive in the jungle... and in Lore! -- Desc: Lucky you! You won the "Primal Dagger Tooth". Miltonius crafted this dagger from a smaller Void beast. If creature with a tooth this size can be considered small. -- Desc: When you wield this wicked weapon, your enemies are boned! -- Desc: Color changing striped scarfs are the hottest (and warmest) item this holiday season! -- Desc: Polish purifies your Claw of Nulgath giving it the power of light! -- Desc: Polish imbues your Tainted Claymore claymore with divine light! -- Desc: This little rat is still scared of everything after the Kittarian incident. -- Desc: Red-eyed, angry and adorable! -- Desc: Don't blame us if you're mistaken for a working reindeer. Rumor is that you get time and a half on holiday shifts! -- Desc: An honorable sword awarded to those who defeated powerful Yokai beasts. Let this sword lead you to victory! -- Desc: Mmmmm... Mmmmm... roasted Marshmallows! Who knew Chickencow toenails were so flammable? -- Desc: Are you a man with a rocket? Is your fuse burning out all alone? Do you think it will be a long, long time 'till you come back? -- Desc: Swindle says, that there is a "Rounded Stone Hammer"
-- Desc: Some say this blade was found within the dragon's den. So where it originally came from could be anyone's guess. -- Desc: To keep cold during the long winters, bundle up and lead your people to salvation! -- Desc: Protect yourself at all costs because the fate of the Northlands depends on you! -- Desc: The gift unwraps to reveal... what the...? How will you get down chimneys with these equipped? -- Desc: He knows when you have been naughty... and is ready to deal with you! -- Desc: Pleased to meat you. Now do your wurst with your spinning Sausage Chucks of doom! -- Desc: This striking red outfit will dazzle friends and foes alike… but keep away from angry Bulls! -- Desc: Brought over from the mainland with settlers of new lands, this sword has protected many homes from all types of invaders. -- Desc: Swindle holds his nose. Ewww... that there is the "Sharkbait's True Head". Makes a great helmet if you can stand the smell! -- Desc: The Nightmare Child has gifted you with this staff as a reminder of all the fun you've shared with her! She hopes when you see it, your screams will be of laughter, unlike those of the souls trapped in the weapon. 28 January 2013 => You found this item after slaying a Mana Imp. Could Graveclaw the Defiler, trapped for so long in Shattersword Cavern, have already contacted creatures above ground? 29 January 2013 => You found this item after slaying a Bandit. Could Graveclaw the Defiler, trapped for so long in Shattersword Cavern, have already contacted creatures above ground? 30 January 2013 => You found this item after slaying a Minx Fairy. Could Graveclaw the Defiler, trapped for so long in Shattersword Cavern, have already contacted creatures above ground? 31 January 2013 => You found this item after slaying a Skeletal Warrior. Could Graveclaw the Defiler, trapped for so long in Shattersword Cavern, have already contacted creatures above ground? -- CLICK FOR Shattersword Kamas IMAGE (The different between each Shattersword Kamas is at the color of the wrapping on the handle! -- Desc: Brotherblade to the Iceheart, the Icerender may only be drawn when the world has ended... and one must break through the ice to a new dawn! -- Desc: Scalding flames of silver lick the air as this baby unicorn charges with you into battle. Fearsome, glowing eyes stare at the soul, ripping it to shreds slowly as you cut your enemy down. Paired with this fearsome youngling, you will not be stopped. -- Desc: Rah Rah Sis DOOM Bah! -- Desc: Swindle says, ah it's a "Small Hammer". Hah! -- Desc: Legendary Smuurvil Pain Spoon only given to their least favorite dinner guests. -- Desc: Wow you must be lucky! They say no one can catch a Sneevilchaun. Although, Sneevilchaun's don't seem to run as fast as a leprechaun. -- Desc: There must have been some magic in that old silk helm you found, for when you equipped it on your head, you began to /dance around! You are the Snowman, and alive as you could be, and the heroes say you can /laugh and slay just the same as you and me! -- Desc: You are a Snowman, who has a jolly happy soul, with a smiley face and a carrot nose and two eyes made out of coal! -- Desc: It's exactly what it sounds like! It may not be as conventional as a conventional oven... but it gets the job(s) done! -- Desc: Swindle says, that dagger is a "Spinal Tap". Miltonius like these daggers. -- Desc: It not THAT big. Me seen bigger. -- Desc: Mayhem is everywhere. Insure it spreads using this. -- Desc: Introduce your enemies to the big chill known as their icy graves! -- Desc: Send your enemies into their frosty grave with this tomahawk! -- Desc: The most DELICIOUSLY dangerous weapon in your inventory! -- Desc: If you can't pull the Sword from the Stone, then just uproot the whole thing! This is one sword that really rocks! -- Desc: Legend says that the One who pulls the Sword from the Stone shall be made KING! ...but you can settle with just a shiny silver sword, right? -- Desc: You are what you eat. And if you eat tacos... you are a Tacomancer! May the fates (and arteries) have mercy on us all! -- Desc: When you get tired of /samba, you can also try to tango! -- Desc: Wield this to destroy what the Temporal Tyrant has wrought! -- Desc: All hope is gone! -- Desc: The head of the mighty (delicious) Turdraken now sits upon yours. -- Desc: This is the battleaxe of Tlax, the Horc Battlemaster. After finding a rare Rhison Horn for him, he gifted it to you. -- Desc: Gobble gobble gobble and shake shake shake those tail feathers, Hero! -- Desc: Swindle tells you that's a "Trig Buster". Nice prize. Miltonius started to have some made then stopped production. He said, "unlike a blade it's only effective with ammunition. PATHETIC!" His word... not mine. -- Desc: A prestigious cape made from freshly plucked Turdraken feathers. No part of the meal goes to waste! -- Desc: A sleek and impressive armor forged from the scales and beak of the rare and highly fabled Turdraken. Culinary warriors will bow to you. -- Desc: It's like a knife to the chest! -- Desc: Master the culinary arts of Turkey Slaying and make this Thanksgiving a little less foul with a lot more fowl! -- Desc: If Native Warriors live in Wigwams... then Native Moglins must live in Twigwams! This little fish-ice cream loving moglin sure has the Harvest spirit! -- Desc: You've been turned into an undead soldier! -- Desc: Standard soldier helmet... but for undead! -- Desc: Aaargh! It be an undead pirate's cutlass. Meaning the cutlass itself is undead! -- Desc: A shovel sword is about as safe as a chainsaw in a blender. "Undead" has been applied to the name for blatant precautionary reasons. -- Desc: Chaos energy is infecting everything! -- Desc: The sister of the Bane of Nulgath. These are said to be crafted from the fangs of an ancient beast. -- Desc: Possibly... the worlds deadliest creature. Vorpal Bunnies have a keen sense for ultra rare eggs. -- Desc: Everyone wants to suit up in this rare armor. Only a select few will ever get the chance. You have shown your worth in PvP combat and shall reap the awards forevermore. -- Desc: Being called "4 eyes" never looked so awesome! A rare helm awarded to those who have proved their ferocity in combat. -- Desc: When sterling silver blades just aren't enough... enhance them with the element of garlic! A super rare blade only suitable for fearless heroes. -- Desc: A super rare pair of wings ruthlessly scavenged from your latest victim. "Were" them with pride! -- Desc: ...well what did you expect would happen to all the leftovers? -- Quest: Citadel: 6th Task - Magic Overload! -- Desc: Get your head out of the clouds and into the canopy with this ancient Arbor head morph! -- Desc: You deserve the sword of a Paladin. It took you quite some time to obtain this weapon! -- Desc: Whack'em in the head and they'll stay dead! Until they respawn. And then whack'em again!